The urban fountain is at the same time an element of enjoyment and public service, guaranteeing an access to the drinking water for all. Our models of fountains are perfectly adapted for all the places, that they are public or private parks, games areas, picnic places. 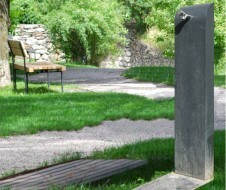 This water source is offered to your users, within the green spaces of a head office as a community. When the trends are in the reconquest of the outdoor spaces, with practices as the urban sport, the fountain of outside stays more than ever a safe bet.